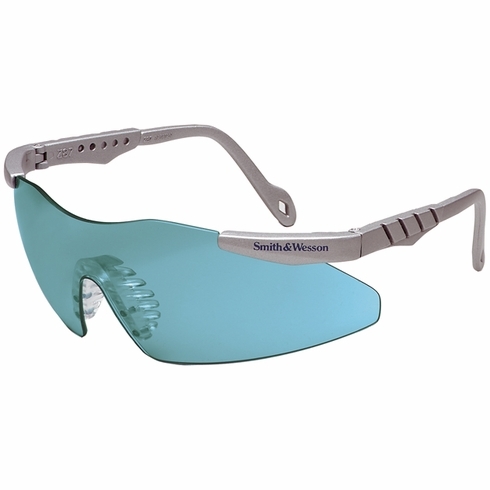 Smith & Wesson Safety Eyewear, Magnum 3G Teal are ergonomically dimensioned for a 3 point fit, the ultimate in comfort. Exceeds ANSI Z87.1 -2003 High Velocity Industrial standards and provides maximum UV protection. 7 base cut-to-shape spherical UV BLOCKER lens with nose pad posts molded as one unit. New improved fit ergonomic nose pad with self-adjusting rubber fingers. Elimination of retention screws with new mechanical snap fit of lens to frame.